Save the date for this year's event: Tuesday August 6, 2019. Registration and sponsorship information coming soon. 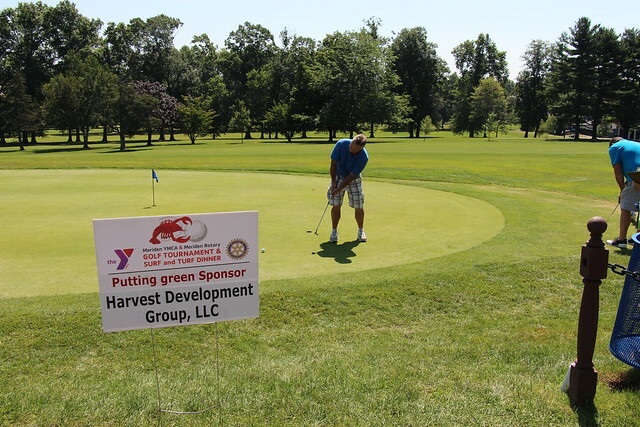 Thank you to everyone who attended the 2018 Meriden-New Britain-Berlin YMCA & Meriden Rotary Golf Tournament, Surf & Turf Dinner & Kids' Picnic! Click on photo above to see photo album from last year's event. Join us for a fun time for a great cause! The Meriden-New Britain-Berlin YMCA and the Meriden Rotary have teamed up for our Golf Tournament, Surf And Turf Dinner, and Kids Picnic. Proceeds benefit the YMCA Annual Support Campaign and the Rotary's community projects. The Golf Tournament is a scramble format. Greens fees, cart, range balls, lunch, and dinner at Mountain Mist. Complimentary wine, beer and frozen drinks at dinner. Dinner includes: lobster, filet mignon, corn on the cob, potato, frozen drinks, beer and wine. If you are a golfer, this is included in the event price. Dinner price for non-golfers: $50 per person. Kids will have their own special picnic while you attend the Surf and Turf dinner. Children will be supervised by Meriden YMCA Child Care staff. Kids will have fun playing in the bounce house, creating arts & crafts projects, and having their own picnic with hamburgers, hot dogs, chips, and drinks. Please note some GPS systems will send you to High Hill Road in Wallingford which does not connect through. Follow this link instead. Click here for directions. the Y & Rotary web sites and in the Y e-newsletter. Register at the Meriden YMCA at 110 West Main Street, Meriden CT 06451. At the Y, no child, family or adult is turned away. We recognize that for communities to succeed, everyone must be given the opportunity to be healthy, confident, connected, and secure. Last year we helped our neighbors by providing over $100,000 worth of free or subsidized services to children and families in our community. Through our Annual Campaign we provide scholarships for summer camp, swim lessons, youth sports, the P.A.C.E program to break the cycle of childhood obesity, child care, family memberships, and more. The Meriden Rotary Club is an organization of both men and women who come together to serve their community and enjoy great fun and fellowship. Meriden Rotarians are a diverse, energetic, successful and friendly group of leaders who provide their time, expertise and resources to help their local and world communities.